A few years ago my Mom and I went to a cooking class in Bloomfield - Pittsburgh's "little Italy" - for our birthday gifts, thanks Dad! The class was put on by Maria, the owner of our favorite Italian gift shop. (Dominic the Donkey visits there every Christmas, but that's a another story for a different day!) We gathered around a big dining room table in the apartment above the store while Maria got cookin'. She taught us how to make soups, homemade stock, biscotti, etc, while we took notes and eventually ate all of the delicious food she made. We ate, and ate, and ate. 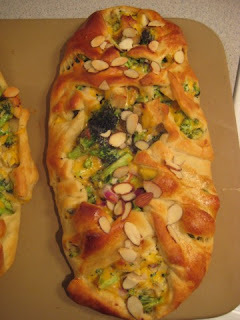 Everything was so good, but the BEST thing she made that day was what she called a "broccoli, chicken, cheddar braid." 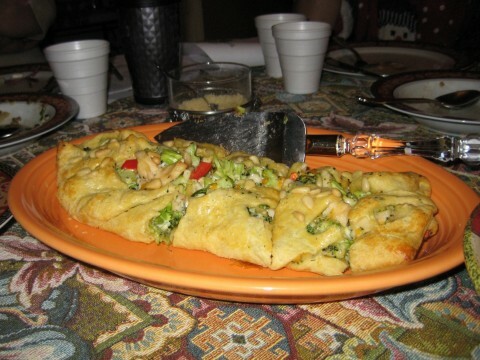 As you might guess, the ingredients include broccoli, chicken, and cheddar cheese, plus mayonnaise, dill, red peppers which I replace with red onion (note: I HATE peppers and remove them from every and all recipes.) and garlic. You mix all of those together, then put the mixture into the center of crescent roll dough that's been laid flat. 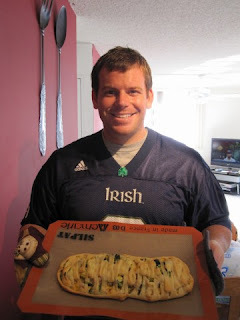 You cut a billion little diagonal lines into the sides of the dough and then "braid" the dough over the top of the mixture, which is much easier said than done! Finish it off with an egg wash and either pine nuts or slivered almonds on top and bake it in the oven. It turns out to be flaky and buttery on the outside and cheesy and delicious on the inside. My favorite part is the slight flavor from the dill. MMMMMMM! This is Maria's creation and the first time I ever tried the glorious, glorious recipe. Here's one that I made, using almonds instead of pine nuts. Lay each package of dough flat on a greased cookie sheet. If you can't find the seamless dough, press the seams of the triangular crescent rolls together. Spoon half of the chicken mixture onto each. With a sharp knife or scissors, cut the dough into one inch wide strips around the edges. Bring the strips up over the top of the filling, rotating sides to get a braided effect. Repeat for the second braid. OPTIONAL: Brush each braid with egg white wash and sprinkle with sliced almonds or pine nuts. Bake at 350 degrees F for 25 minutes, or until the dough is firm and golden brown. Allow to cool before cutting. I got a brilliant idea to turn this braid into individual cups made in cupcake/muffin tins! What took me so long to think of that? Cut the flattened dough sheets into 12 squares each (3 wide by 4 high worked best for me). Spray 2 cupcake/muffin tins with non-stick cooking spray. Place one square inside each compartment, then spoon equal amounts of the chicken mixture into each. Bake at 350 degrees F for about 18 - 20 minutes. This is so much easier and tastes just as good!